FOCUS TRANSPORT: PIE IN THE SKY, OR WATER UNDER THE BRIDGE? 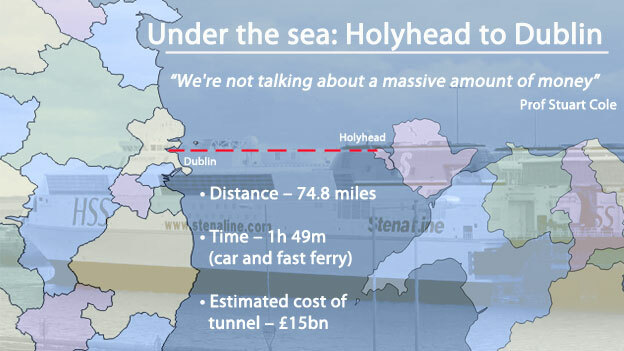 An underwater tunnel linking Wales to Ireland should be seriously considered, a transport think tank has said. Similar to the Channel Tunnel, it has called for a new route to run between Holyhead and Dublin. With an expected cost of around £15bn, the investment would be similar to that of the HS2 from London to Birmingham. The Chartered Institute of Logistics and Transport (CILT) Cymru Wales thinks the tunnel could be ready by the end of the century. In the think tank's report, Vision 2035: Cymru Wales, electrified railways, metro style systems and innovative transport technology could all become commonplace in Wales in the next 20 years. Once these better modes of transport are established, the discussion can then move to the prospect of an underwater tunnel, says the report. According to the CILT, this would be a major engineering and investment project of European significance. Prof Stuart Cole, of the Transport Research Centre at the University of South Wales, supports the idea and thinks it is a cost that can be met. "We're talking about something like £15bn," he said. "Something like the cost of HS2 between London and Birmingham. "So we're not talking about a massive amount of money in the world of governments. "Also much of this money would come from the European Commission." The Irish government has called for similar improvements in transport links between the two countries. As part of the European Union, and an island on the edge of Europe, it has been calling for major improvements in the way it is connected to the mainland. The Taoiseach's office in Dublin, however, dismissed the idea of an underwater tunnel, believing the costs would be too prohibitive. Dr Andrew Potter, Chair of CILT Cymru Wales was more hopeful. He said: "As an essential part of the economy, it is hoped Vision 2035 provides a long-term view of transport in Wales. "By thinking now about the opportunities and challenges ahead, better solutions can be found that make a real difference to passengers and businesses alike."